Victoria Connelly! Victoria's website is bursting with regularly updated content, is easy to navigate and has some great writerly resources. Well done, Victoria! We all cooed over the Meet Me Under the Mistletoe cover when it was released. The soft jewel colours, the font, the glittery snowflakes and stars and the super romantic Lucy Truman illustration: this cover is unabashed chick lit with more than a dash of whimsy and it's our favourite of 2012. Avon (HarperCollins UK). This was a tough category but Avon have really gone above and beyond to provide us with consistently fantastic content and access to their authors in 2012. 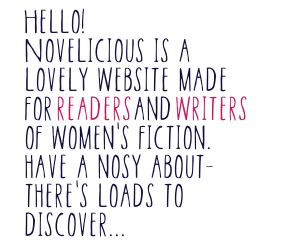 They got involved in our Novelicious Undiscovered competition earlier this year by providing some amazing prizes and it's been a genuine pleasure to work with the Avon team, in particular Becke Parker and Caroline Hogg. The above, combined with a regular output of quality commercial fiction and a fantastic flourishing social media presence, makes Avon an easy choice for our publisher of the year. Rowan Coleman. As well as being an absolutely super writer, Rowan Coleman is a friendly and approachable tweeter. She is consistently supportive of fellow authors and aspiring writers and is a generous re-tweeter. In June this year, Rowan set up a weekly twitter initiative under the hashtag #rowancolemanswritingclinic in which she answered questions for aspiring authors about writing. The Light Behind The Window by Lucinda Riley. Lucinda Riley's story makes you wonder if you would put duty before love, if you could you put your trust in someone you shouldn't and when the unimaginable occurs, how you would react in their place. It also has two unexpected heroes. The Light Behind The Window is beautifully written and haunting. Me Before You by Jojo Moyes. We were all taken with Lou and Will's compelling and heartbreaking story. It made us laugh and sob and kept us transfixed until the last page. This is the book we've most recommended this year and we've yet to hear back from someone who didn't like it. Our must-read book of 2012. Jane Green. We have a bit of a crush on Jane Green. Her books (including this year's The Patchwork Marriage) are some of the most engaging and gorgeously written we've read and her huge success has done nothing to diminish her deep connection with readers. Jane upholds a busy social media presence and blog and invites her fans to share in her life on facebook. Jane also gave us our favourite interview of the year in this epic two part chat with our Amanda Keats. Jane Green is an inspiration to so many readers and writers of women's fiction and we can't wait to see what 2013 will bring for her. Huge congratulations to all of the shortlisted and winning authors. It's been a wonderful year for books! Julie Cohen's Website and Blog. Bloomin' lovely to look at and with excellent navigation, Julie Cohen's website is a must visit. Her blog is updated regularly with a great mix of both writing related and personal posts. Miracle On Regent Street by Ali Harris. The cover of Miracle On Regent Street manages to retain that romantic 'chick lit' feel while still being unique, modern and original. The colours are super pretty, the illustrations match the story inside and there is not a headless woman in sight! Simon & Schuster UK. One of the best things about writing about books for a living is getting to meet the publishers of those books. Not only are Ally Glynn and Alice Murphy an absolute pleasure to work with, supportive of book bloggers and passionate about Chick Lit, they (along with the lovely Sara Jade Virtue) helped to create and run Simon and Schuster's fantastic dedicated Women's Fiction site - Books and the City. Well done, guys! Read this interview with Jen about writers using twitter. You can read Cesca's review of this wonderful book here. Miranda Dickinson. This woman is an inspiration to all us aspiring writers. Miranda has hit the bestseller lists with each of her three novels, has vlogged her entire journey of the writing and publication of It Started With A Kiss, invented The New Rose Prize for writers and on top of that is just utterly lovely and humble. We think Miranda Dickinson is awesome and we are very glad to award her our Author of the Year 2011.